On a designated Sunday, After each service: Attend a brief orientation meeting in St. Luke’s Chapel, first floor of the Prayer Tower after each service. On a designated Sunday, 1pm - 3pm: St. Luke's Chapel. Community tour, mission, vision & Unity principles. Our discussion includes a tour of the church and information on Unity's history, teachings, our church vision, meditation and the four commitments of membership: commitment to your own spiritual growth, regular attendance and daily prayer, proportional giving and spiritual service. On a designated Sunday: Spiritual Baptism during the Sunday service. If you are interested in becoming a member, please speak with Rev. Blair or call our office (619) 280-2501. Membership at Unity San Diego offers you the opportunity to grow in Spirit. Membership with Unity San Diego is an opportunity to step into a deepr awareness of Spirit in our midst and a path to enliven your spiritual growth through sacred community. Whether you are new to Unity San Diego or have been a long-time congregant, we encourage you to consider "officially" becoming part of our member community. As you pursue your spiritual path we encourage you to explore what it means to be committed to living universal truths. Membership in Unity is not required, but is encouraged as a way for an individual to commit to his or her own spiritual growth. Active members attend services regularly, participate in events, invest their time in service to our spiritual community, attend classes and contribute their financial gifts to Unity San Diego. Becoming a member confirms to you and your spiritual community that you are committed to living a lif e of love, abundance and meaning. It affirms a sense of commitment to personal spiritual growth, ownership of your individual beliefs and a willingness to make a difference. Only members can participate in voting on important church matters. More than collective conversation, we need you to be actively engaged in our community by the sharing of your vision and voice for our community. Dedicated Prayer Chaplain Wellness Connection - our members are assigned a dedicated chaplain who will not only hold you in prayer, our chaplains can also pray with you on a monthly wellness call. Community & Connection: Be part of our Annual Dedication Ceremony in sacred community and recommit every year to living a life of purpose and sacred focus (to be initiated). Classes required for membership at Unity San Diego are offered two or three times a year. Membership orientation culminate with a sacred blessing from our spiritual community during our celebration services on membership Sunday. To become a member, attendance is required at all three meetings, which includes the spiritual baptism. Class pre-registration is strongly requested and appreciated. 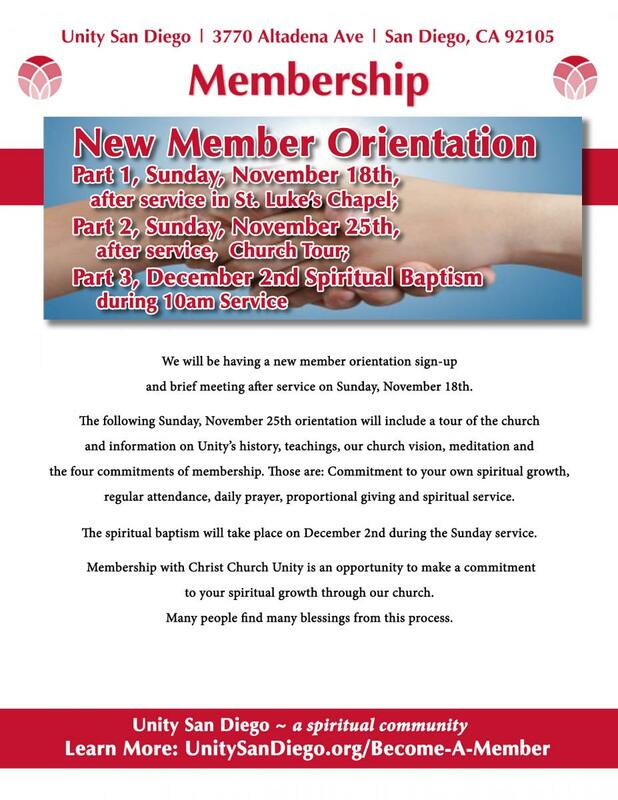 Membership orientation is offered by our staff and by Unity ministers & Licensed Unity Teachers (L.U.T. ), including xxxxxxxxxxxx.